There are a number of benefits to beards- they protect the skin, provide warmth in the winter, and reduce the necessity of shaving. Not to mention their potential to be extremely stylish. But growing a beard is also a commitment that requires a regular care routine. Here are some tips for washing, shaping, managing and maintaining a healthy beard. Just as you would wash the hair on your head, it’s important to also wash the hair on your face. There are a number of special beard shampoos, as well as conditioners designed for both head hair and beard hair. If you have oily skin, it might be advisable to wash your beard every 1-2 days, whereas 3-3 days is recommended for men who have drier skin. This may still vary depending on the coarseness of the hair and the climate you live in. Ideally, you should aim to keep your beard clean and hydrated, rinsing with water between washes if necessary. If you are just starting to grow a beard, wait at least a couple of months before trying to shape it. Trying to shape a beard too early is a common mistake, and one that can take several weeks to rectify. Once you have about 2.5cms to 3.5cms, you are ready to start shaping your beard. The ideal shape for your beard will depend largely on the shape of your face. A streamlined beard is more suited to a slimmer face, whereas rounder faces tend to look better with fuller beards. If you don’t feel confident in your decision, book in with a local barber and men’s grooming specialist. They can help you establish your initial beard shape, and advise on how to maintain the style yourself. Beard scissors are generally small and have a micro serrated edge, making them ideal for accurately cutting facial hair. These can be used on both beards and moustaches. Checkout Beard Products Australia to get your beard grooming products. Beard trimmers are ideal for maintaining shorter beards. They have a number of guards to choose from, each corresponding to a different length. When using a beard trimmer, remember that cutting against the grain cuts more hair compared to cutting with the grain. Shorter styles can be cut in either direction. Combing your beard regularly removes tangles and helps keep your beard looking neat. Your beard will be easier to style if you comb it shortly after washing, whilst it is still damp. You should also invest in a high quality beard brush – this will loosen dead skin cells and bring them to the surface, so that they can be easily washed out. If you find your beard feeling dry or wiry, you may want to consider using beard oil. Beard oil is designed to provide moisture to the beard and also to the skin beneath it, improving the overall appearance, health and texture. The best time to apply beard oil is after a warm shower, when your beard hair is clean and at its softest. It’s important however to ensure that your beard hairs are dry before you apply to beard oil, as water will hinder it from being absorbed. 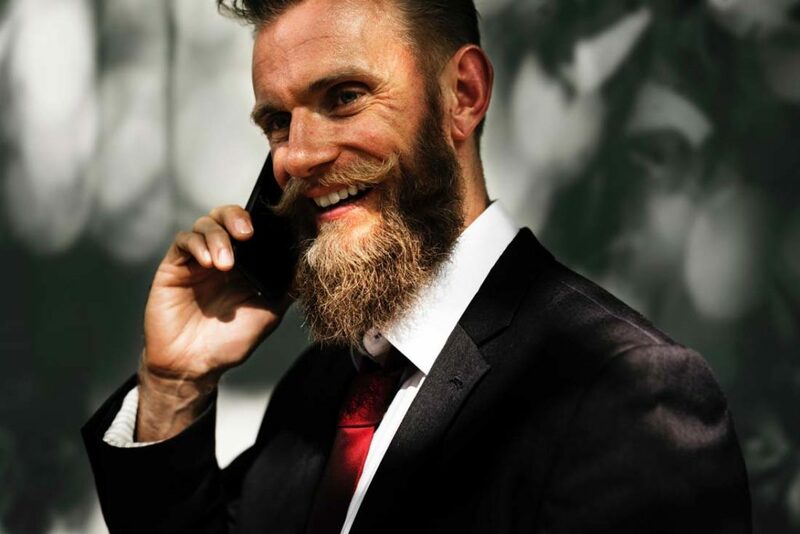 There are a number of different ingredients typically found in beard oils, with jojoba oil, hemp seed oil and coconut oil being among the most popular. A balanced and micro-nutrient rich diet promotes skin health and, consequently improve the growth and health of facial hair. Vitamin A aids in the production of sebum, which is what helps keep the face moisturised and, combined with beard oil, helps to prevent beard dryness. Meanwhile Vitamin D, commonly known for its role in bone growth, has also been linked by researchers to hair growth. If you suspect you might be deficient in any essential vitamin but are struggling to adjust your diet,beard growth supplements may be an option. These supplements usually combine a number of vitamins associated with skin and hair health. This entry was posted in Beard Tips. Bookmark the permalink.